Was up at Bretton Woods today in New Hampshire. It’s an hour and 45 minutes north of my hometown, but it’s always worth the drive. 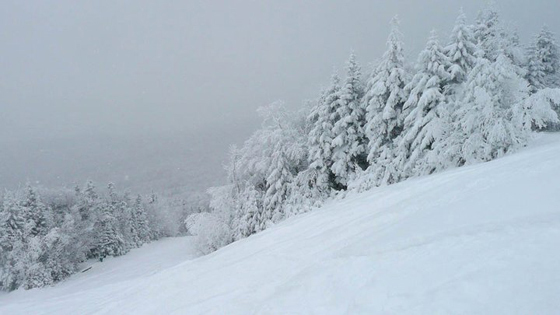 I swear, every time I go up in The Notch it’s been snowing at Bretton Woods, today was no exception. Around Waterville Valley it started with the flurries and continued to get heavier the farther north you traveled, by the time I got onto rt.302 heading east over to Bretton Woods it was a full blown winter storm. The weather last night called for possible snow accumulation of 1-3 inches, so pulling into the lot before first chair and seeing 6+ inches on the ground of fresh snow was a great surprise. Not to mention the 5″ they got the night before. The snow continued heavily the entire day and by the time we left there was over a foot of powder on some newly open trails. It was still snowing when we left. So if your on the East and looking for good snow definitely check out Bretton Woods. Apparently, no one else got dumped on even close… hence The Black Hole of the East.